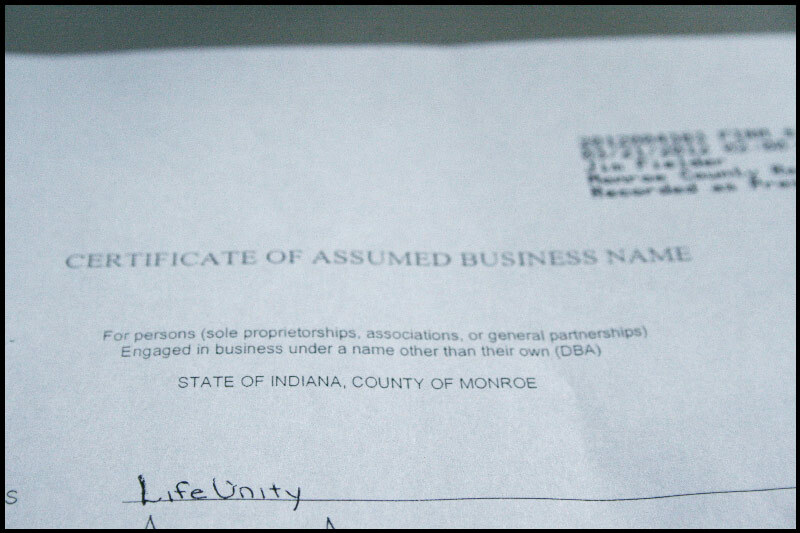 Yesterday I registered LifeUnity as a business with our county. It is such a small little thing, but it feels huge. It is one step of many that are being taken in this direction. LifeUnity and what I am doing through its name will remain the same. Registering it as a business (and the succeeding steps) really only serves a few purposes. The main reason? To reframe what I am doing in a way that makes me feel committed and disciplined to its success. Of course it shouldn't matter whether what I am doing is a business or a hobby. But when I am deciding between painting another picture or just lazing around, it is that mental reframe of the painting as part of the business that will get me to the studio area. When I am deciding whether to sleep in or get up and write, it is that mental reframe of the writing as a business that will get me out of bed. I will continue to define what I am offering to you under the business of "Awareness Arts". (If you aren't sure, check out the "Awareness Arts" page or the "About.) The question that I am most interested in right now, however, are the ones surrounding "success". If I am committed and disciplined to the success of LifeUnity, I probably should know to what I am committing. Success for LifeUnity is creating enough income to cover expenses for LifeUnity (including materials, creative space, time, and directly related educational/growth opportunities) while simultaneously providing exceptional mindful-awareness invitations and opportunities. Success will be monitored first by the growth of mindful awareness of those interacting with the business (including myself, business partners, readers of the site, and clients). Monetary profit will be secondary. I partly choose this definition because I can. I feel unbelievably blessed to be in a situation where I can operate through this business model. In our household, my husband provides enough income to cover expenses outside of my business. It has taken me a long time to come to terms with the fact that I am supported. Nearly eight years after making the decision to leave the out-of-the-house workforce to be with our children, I still have a hard time being at peace with not significantly contributing to our financial well-being. I am afraid of not making money. Without income, who am I outside of a mother? I know in some ways that sounds horrible (a mother is an honored position!! ), but such are some of the thoughts that go through my head. I also choose this definition because at this point in my development, nothing else feels (more) aligned. I don't want to make profit in order to afford a new dress or spa weekend every month. (Sure, it sounds nice! But when I think about creating a painting and selling it to get a facial, my soul cringes.) But if I am to continue doing what I am doing, I need income. I must make "profit" in order to support those things which will keep LifeUnity operating. I've bounced between these two definitions for too long: cringing at the idea of making money but feeling deeply guilty as our bank account drains to pay for internet services, waxes and paints, and educational opportunities that provide for my own growth to pass along through LifeUnity. As I walk down this path of "business" I do so treading very carefully. The sirens of More and Money and Fame sing very sweet and seductive songs. Fortunately, my job is an Awareness Artist. My job is first to keep myself mindful and aware (and not to fall victim to those temptresses). My job is to share with you what I'm learning in the process of an awakened life, to invite you into your own exploration, and to provide words, art, teachings, invitations, encouragement, and SPACE for you to live a mindfully aware life. And with that as my business I am joyful and determined to succeed.